I don’t care what they say, you cannot declutter your home overnight. Especially if you are a garage sale shopping (ahem, reformed) pack rat such as myself. I have a large home and let me tell you…it was F U L L. I had so much stuff shoved in my attic over my garage, the ceiling actually cracked from the weight of it all. Hubs finally put his foot down and told me to get that attic cleaned out before it ended up on the garage floor! After years of saying I would do just that, I finally got the motivation I needed. It took a few weeks to get through my entire attic, but after it was done I caught the bug and began tackling the rest of my home. I have since added decluttering to my weekly to-do list. Why? Because simplifying is a lifestyle, not a do and done job. Incorporating decluttering into your weekly or even your daily routines and schedules will develop habits that will streamline your home on autopilot. So, what if you are just starting? When you finally decide to declutter your home, I mean really declutter, it is a very daunting task. There are just so many rooms and closets. You may look at your home and feel overwhelmed before you even begin. I was right where you are now, stuck before I started. Head full of questions. How will I ever be able to get through it all? Better yet, HOW do I start? How long will it take to declutter your home? I am sure you do not have two months or even two weeks of uninterrupted time to dedicate to decluttering your home. I don’t either. I have found that the best approach is to simply do it one day at a time, one drawer at a time. Tell yourself this is an ongoing task like doing the dishes or making the bed. By doing so you will eliminate the pressure that a full-blown purge can bring. Declutter, as you go, is a refined technique that can definitely save your sanity. Sometimes when you only focus on the big picture things can get so overwhelming that you are beaten before you even begin. The best way to approach any project this size is to break it all down step by step, room by room, drawer by drawer. 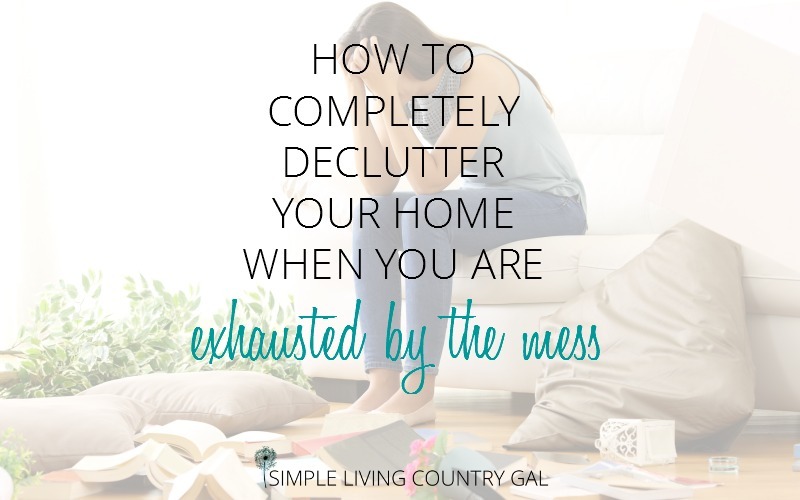 Here is your step by step guide to decluttering made simple…..because I am all about simple. 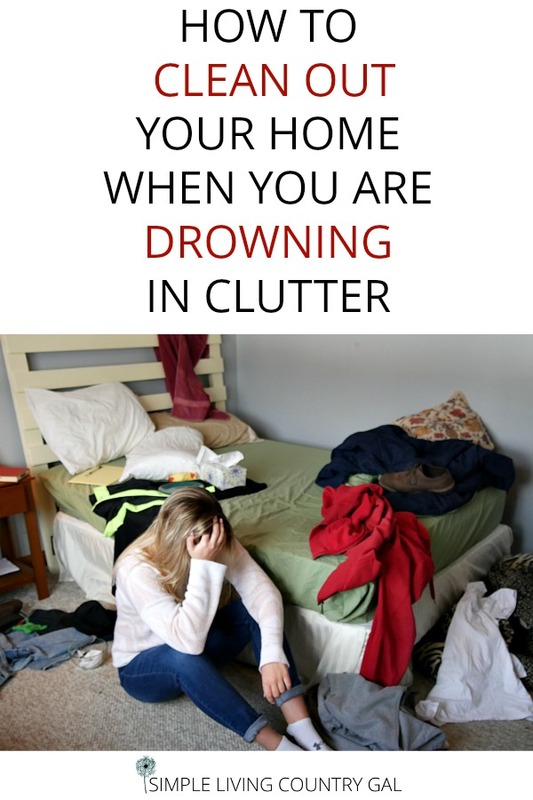 Especially when you declutter your home. Each week pick a room. Each day set the timer for 30 minutes. For every 30 minutes pick a section of that room. When the timer starts, you need to be focused and driven. Work straight for 30 minutes going through as much as you can as quickly as you can. Continue working in 30-minute blocks until the room is completely and totally decluttered. Set up the new room to be functional for what it is intended for. By breaking things down like you no longer have a massive project but rather bite-sized chores that will get you amazing results. It is all about how you approach it. If you are a bit overwhelmed at this point, don’t worry I have help! Jump on over and read Decluttering When Feeling Overwhelmed and relax..you got this! When you decide to purge this way you need to set up a sorting area. I suggest you choose a place that is out of the main living area but one you will see often and can use as a gentle reminder. Your sorting area needs to contain 5 boxes, bags, totes or tubs. I know setting up a sorting area is nothing new. My twist on this is to ALWAYS have one set up. This keeps simplifying at the forefront of your mind and reduces the clutter in your home on a more slow and steady pace. Having an “in your face” sorting area like this is perfect when you are just starting out to declutter your home. Seeing your boxes and totes as you go about your day will give you the “nudge” you need to keep going. Fill those boxes up so you can finally have the home of your dreams. One free of chaos and plenty of room for love and family. Not a fan of boxes sitting out? Jump below to find alternatives that will fit any decor in any home! How to use your sorting area. The donate box should be big, really REALLY big, This will make things so much easier on your emotionally if you know you are giving your items a new home rather than just throwing them away. I am not a “rip the band-aide of in one shot” type of gal. I need to touch my things, look them over, then let them go. By giving them a specific home such as a family in need, you are no longer just tossing things out the window but rather giving your items away with intention. Change the way you think about your things when you declutter your home. You are not just tossing things in a box for charity…….you are helping families in need. Young families just starting out that simply need a helping hand. Say that over and over until it sticks. If you look at your donations as gifts for others you will help to alleviate the emotion of letting go. The giveaway box is specifically for items that your family or friends may like to use in their own homes. Like the donation box, this box helps you remove your items with intention. You are now giving your things that were buried and ignored in the clutter a chance to be used. Keep a pad of post-its in the box along with a marker and label each item you want to give new life to in another home. This step only takes a few seconds and is life-changing. Helping others is a pretty powerful thing and once you get into the habit of looking at your clutter as a way to help a friend there will be no stopping you! The maybe box is for those items that you are not quite sure you are ready to part with. Items that you haven’t used for a while but you are not sure if you will need them or not. This is especially helpful in the kitchen. Gadgets and extras are always hard to let go of. What if we need it? I know, I was right there too! I held on to so many things because I was afraid I would need them someday. Then I started using a maybe box. Let me just tell you that the maybe box was a game changer for me. By having a maybe box, I was giving myself permission to keep what I loved. At least for a little longer. Items in the maybe box can sit there for months if needed. As the box gets full and you have more to add, you will need to remove a few things. Start at the bottom where you have items that have been there for a bit. If you haven’t used them in a month or two….then you can safely let them go. 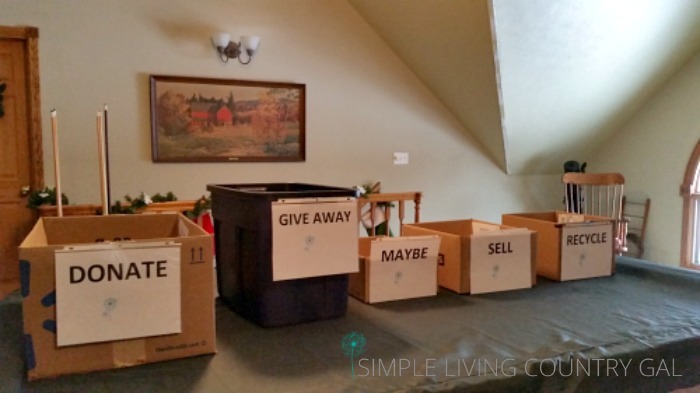 Having a maybe box helped will remind you that this isn’t an all or nothing declutter. This really helped me to deal with the letting go part of decluttering and I know it will help you too. When you declutter your home there is nothing more therapeutic than getting cash for your clutter. You heard the old saying, “one man’s trash is another man’s treasure”. Those words are so true! Start a pile of things to sell and get cash for all your hard work. Not interested in a full yard sale? Then sell your things on Craigslist, Facebook or even the old fashioned way…the want ads in the newspaper. Use any money you make on something truly special. A family vacation, a room remodel for your newly decluttered home or even an upgrade on your family car. Make this decluttering project a win-win and find the motivation you need to keep going. This box is pretty self-explanatory. Before you throw it out, make sure it cannot be recycled first. Plastic, metal, paper, glass. Not sure? You can read here the guidelines of recycling for more information. Sometimes the first step when you declutter your home is the hardest, but like Nike says…just do it. I like to start with the trash first. This is an easy way to get your feet wet and completely painless. No one wants trash in their home, remove that without guilt or emotion. READ: DECLUTTERING FOR BEGINNERS – HOW TO START! Okay then, stop what you are doing. Right now, right where you are. Look around you and see if there is something you can grab right this second to purge. It can be anything, just find one thing and get rid of it. Go ahead, I’ll wait……….did you do it?? You just took your first small step to an to declutter your home. I know that sounds so silly, doesn’t it? But instead of stopping there, make that one thing five things. Then, every time you enter that room for the rest of the day I want you to grab five more things. Remember slow progress is still PROGRESS. And that is all we are concerned with at this point. You now need to learn how to weave decluttering into your day. To help declutter your home make it a daily habit. Start in the morning. When you are getting dressed and you are grabbing socks take a look. Are there any items you can easily remove right then and there? Socks with holes stretched out or simply pairs you do not like. Gather them up and take them to your sorting area. Toss the bad and donate the no longer wanted pairs. Later, as you are making dinner ask yourself if you really need 7 spatulas? And why are you keeping the one with the handle that always falls off? Take just a second to pull out a few things from your overcrowded drawer. Before you head off to your sorting area, why not grab a coffee mug or three. If you are like me you have tons of coffee mugs and some that haven’t seen the light of day in years! After dinner as your family relaxes in front of the TV, take a quick glance. Are there any pillows that are no longer needed? How about blankets that haven’t been used in ages? Remove a few so you can easily see and use the rest. READ: GRADUAL DECLUTTERING – REMOVE THE CLUTTER WITHOUT THE STRESS! Before you know it you will have filled all your boxes and in just one day too! Look at you go!! You are well on your way to a clutter-free home. Using this process to declutter your home will not show results overnight, it will, however, make this large undertaking much more manageable and actually fun to do. The best part about using this system is you can implement it in any room at any time. I have been purging for years now and I still pull out donations throughout my day. I have several baskets like this one scattered about my home specifically for items that need to go to my sorting area. As you begin to thin out your things you will soon realize that you simply do not need as much as you once thought. Letting go becomes easier and buying unnecessarily rarely happens. I cannot tell you how nice it is to come home to neat and tidy kitchen counters. 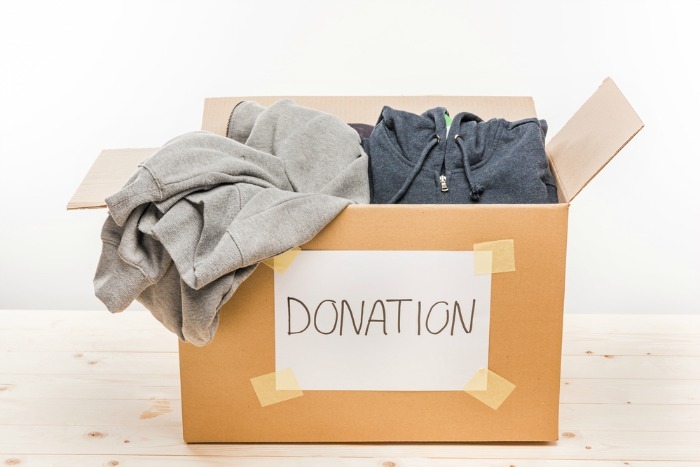 Another plus is you do not send your donations off until you have several boxes full, by that time you will know if an item you have placed in the box truly needs to be there. If you do not go looking for a donated item in a month or so you must not need it so you are free to let it go. This really helps to declutter your home easier. Warning, this process is very addicting. Once I started getting my rhythm of purging I loved the results I saw. I no longer had to move several unused appliances just to prepare our dinner. I spent less time looking for things and much less time cleaning things. The stress of living in a cluttered home slowly and noticeably began to dissipate. For those of you that find it hard to let go of things. This method is an easy way to get your feet wet in decluttering. Knowing you are the one making the choice of what stays and what goes is very liberating. Remember your donations will not leave the house instantly; feel free to place questionable items in your sorting area knowing you still have time before making that final commitment. Finally, doing this at your own pace makes the task as large or as small as you choose it to be. Tip: Is your donation box full but you are still not sure you are ready to “let go”? Put that box in the trunk of your car. Let it sit there for a while. It is out of sight but not out of mind. This will give you a bit longer to adjust to those items being out of your home and off of your counters. Friends, this is not an all or nothing guide to declutter your home. If you love something I give you permission to keep it. Just make sure you honor those items in a way that show their value. Do not keep them packed in boxes hidden in the attic. Find a way to display what you love so others can enjoy them too. Celebrate your successes no matter how minor they are, before you know it those small successes roll together to make one large life-changing victory! My Favorite “Declutter Your Home” Helpers! My favorite bins-perfect for your sorting area. My favorite baskets-keep clutter from building up. I love these baskets for blankets in a family room. These baskets are perfect for paperwork. Use this basket on your stairs. These baskets look amazing in the kitchen! Thank you so much. I love the thought of donations to help others. This thought will help me unclutter our home. I am glad that little tip helped. Another idea is to give harder to donate items to family and friends. I found that by giving my things new life with people I know and love makes it much easier to let go. Thank you for this insight. I’ve been working on Decluttering for a year on weekends. Big and overwhelming task. About every other one something would come up that would interrupt my plans for that day. So nothing would get done. So I’m going to try your way. I found that keeping a “to get rid of, clothing bag” near the laundry room works so well. When I wear something that Isn’t comfortable any longer or I don’t like it like I used to, instead of putting it back in a drawer or closet after washing and drying it I put it in the donation bag. Helps a lot. I am so glad you found me, just in time haha! If you really need some help, you can sign up for my free eCourse. It’s designed to help declutter and simplify your home. You can start it any time and there is a free Facebook page just for those taking the class. It is perfect for support and tips from others in the same boat. I was going to mention moving. It is amazing how much we throw out or donate; Then we get to our new place and if you’re like me, you throw out even more! Then part three of the story, a couple years after you’ve been settled in your new hose, you realize there are boxes in the garage, attic, basement (wherever) That you haven’t even unpacked. I have been in my Townhouse for 4.5 years and have not used the Christmas decorations I have in the garage. I think it’s time to toss! What a great idea. I already have the boxes and bags set up so I can start today instead of waiting until I can find a huge chunk of time to dedicate to the task. I have a large house and most posts on how to remove clutter are based on small spaces. Your suggestion seems much more attainable, thanks for sharing. I have decluttered my entire house this way. It is a lot easier doing it at your own pace rather than trying to get it all done in a day or two. Too much pressure and too easy to quit. It’s “Spring Time” now and I have been dreading this for a good minute. Thanks for sharing! I will definitely start the process this week! Right on time! You are right, this is a perfect time. Get it done so you can get outside and soak up some sun! You are so right about this process. When I complete one area of my house, I am so proud of it and will never let it get cluttered again. To tackle a bigger area, I wait for the inspiration to come to me. Once I start, it is easy to keep going. I can always do a little something each day without too much trouble. The result of getting this done is a big weight lifted from your shoulders and pride in your home. Hi Tracy Lynn, I’m a Tracy Lyn, too! I’m new to your blog, but love it already 🙂 I REALLY need to declutter & purge before I go crazy, but I am SO OVERWHELMED! I really think your advice in this post will help kick start me, but HOW DO I PRINT IT!? I sent you a copy of the post to your email. I hope you received and good luck in your decluttering journey! This is a great article. I like how you emphasize this a journey not a quick trip. I have vowed this year to lessen our “stuff” and not buying things unless it is a necessity. This will help the journey be easier. I sit here with tears in my eyes finally having hope that I can do this and start living again. It would also help me to have a print out rather than going on memory or running back and forth to the computer. I am so thankful you are here and my post was able to give you a little peace. Please know you are not alone and if you want to talk just email me. 🙂 I think a printable is a wonderful idea and I will work on one this week. If you are on my email list I will make sure you get a copy sent to you. Best wishes, and no you are not alone! I am so happy you are beginning to work through things. Yaa, for you!! Found your website today. Just what I need, just the two of us in less than 1000 square ft. I was raised a country girl and our house was the last to get attention. Farm work and animals came first. We had good food, clean clothes but cluttered house. I try to be organized but then things don’t get back to there home. House is clean but CLUTTER. I am so glad you found us and I hope you find some useful tips and inspiration to help when you get stuck. If you want even more help join my email list and get loads of freebies just for signing up! Simply great info!! so thankful and blessed to read this blog. Thank you for sharing !! This was a good read! It is helpful to divide into categories! I love your ideas but I am the worst procrastinator!!! I will try to do a little each day. After all Rome wasn’t built in a day. I couldn’t agree more that decluttering is on ongoing process and that you get addicted to the results! I have been doing something similar with always having spots ready for items that I no longer want. It makes it much more manageable to be able to continually give away things rather than having to do it all at once. I just love this, always having a spot for give-away things is a great way to incorporate decluttering into your day. And I couldn’t agree more, you sure can get addicted to the results! My husband is telling me he cannot take all of the cluttered rooms. I want to declutter but feel overwhelmed.I love your ideas and a copy would be very helpful. Right now I want to start with Christmas decorations I no longer use but where canv they be donated two weeks after christmas? Please send me any suggestions from yourself and your followers. I find Christmas decorations are welcome at most donation areas. Salvation army, Goodwill, or thrift shops will all happily take your holiday decor! If you have children create a decorations box for them when they move to their own places. My kids all asked for a box of things this year and I was so happy I had one made up to give them. Saved them from having to buy it all and got it out of my attic! If you need more help, I have a Facebook group you can join that is all about decluttering! Re: Putting the donation box in your trunk. Don’t keep it there too long. Extra weight in the car means less gas mileage. The mfgrs of cars have small persons drive and take out the seats to get that MPG for the sticker on the car. Re: Printing. I use control, shift P. My screen has stuff like “shrink to fit” and other things, but there’s one for what page or pages you want to print. Usually at the top there’s something like page one of 10 and an arrow. Arrow to the page you want and tell the printer to print page 3 for example. Or maybe you want pages 3 through 5. Just put that in the correct place. Oh, and to save ink, scroll down for the place that says “monochrome” or “Color” choose “Monochrome” Black ink is cheaper than colored ink. I have had several “traumas” in the past couple of years, including an adult son whose kidneys failed, having to get custody of one of my grandchildren and running a farm on my own. I had to move in the midst of these and other crazy situations and have stuff everywhere for almost two years now. I look around each morning and know that something has to be done, but somehow , never get started. i seldom go on facebook, but something made me go to pinterest this morning and I saw your post. 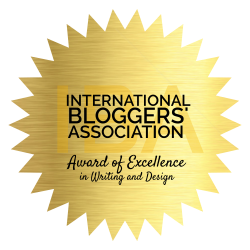 I actually cried….Not only is your system logical and doable, the responses from readers made me feel like i could actually do this. I have just finished gettting my boxes together and actually put some things in each one. I can’t explain how cathartic this has been for me, but I do think that God sent me to you today and i wanted you to know that I think my life is going to start changing because of you. I cannot thank you enough! First, Nancy, let me say I am sorry for all that you have been through. I am so touched that you found my post helpful and the steps tucked inside. Sometimes when you break something so intimidating down into small steps it makes things a bit easier to deal with. I hope you make progress every day and know you will be in my thoughts.